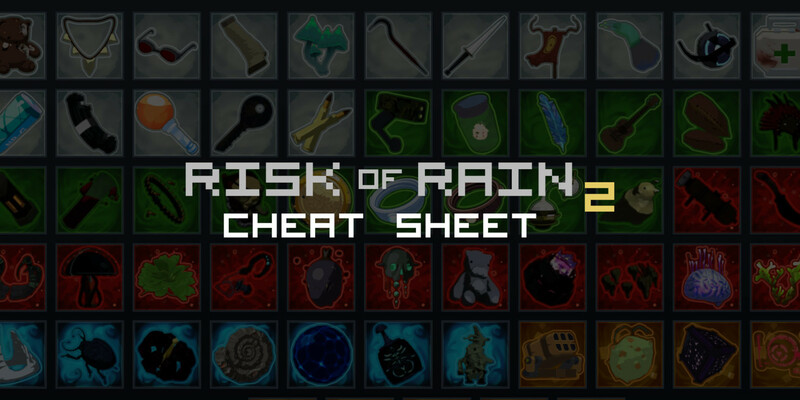 We've created a cheat sheet of all the items in Risk of Rain 2, a game that just came out in early access. The website will give you an easy overview of all items to help you find all the fun, interesting, and/or game breaking item combinations in the game. Check it out at minmax.gg/riskofrain. This time around we've also included a comment field on each item page that you can use to share your thoughts and experiences with other players. We'll keep the information on the cheat sheet updated as the game receives new updates, there are still many new items to come before the game will exit early access. If you want to let us know what you think about the site, and suggest features that you would like to see, don't be afraid to jump into our discord server or tweet us at @MinMaxGG.